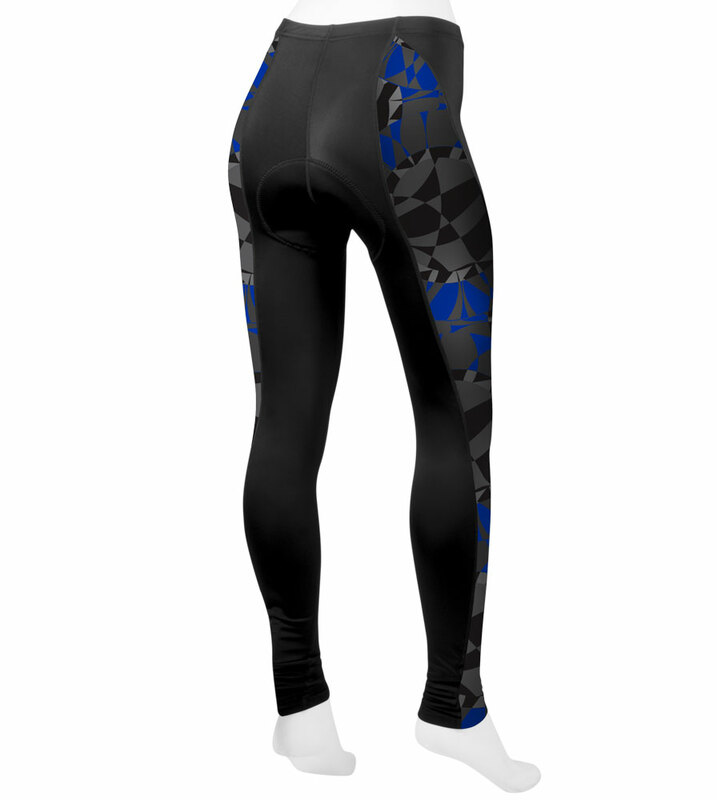 Ride longer and feel stronger in chilly weather with these women's cycling tights from the Mosaic Collection! These tights are made with 80% Nylon and 20% Spandex for all-way stretch, keeping you moving freely while cycling. The waist is a light one-inch elastic that is coverstitched for maximum stretch-ability and comfort. The hems of the leg cuffs also stretch to feel like second-skin, while keeping out the cold air. These tights offer a light compression to support moving muscles and provide an abrasion-free bike ride. All the seams contain flatlock stitching for durability during those long bike rides. The tights are padded with a Top Shelf chamois that is anatomically designed for the bike riding position. The chamois fits around all the curves in the pelvic region, with side wings to offer extra support around your legs and torso. Through multiple layered foams, the chamois improves comfort by relieving the pressure points between your body and the bicycle saddle. The surface of the chamois is also antibacterial. 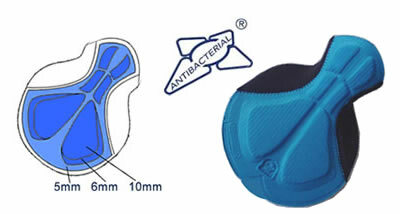 No more saddle sores! The Mosaic Collection features a luxurious sublimation print that is considered fashionable and flattering. The side panels are created with environment-friendly inks that make the bright colors pop. You'll be sure to have other women wondering where you got such a fashion statement. Highest quality, sublimated prints on this spandex tight creates a designer effect to enhance looks and performance. When you look good you are good! 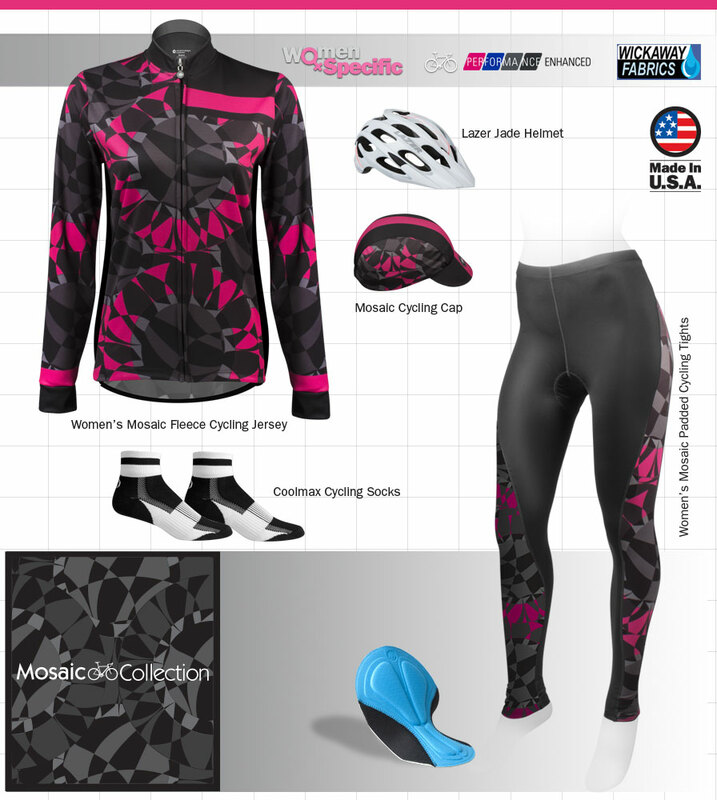 Make sure to check out the matching Fleece Jersey, Padded Cycling Shorts, Rush Cycling Cap, and the rest of the Mosaic Collection for a complete outfit that will be sure to turn heads! Two Fabric Zones, one, the internal crotch area is a rugged 80% Nylon 20% Spandex with 4-way stretch and abrasion resistance between the legs. The second fabric zone is the outer side panels which are technically printed with a sublimation process. The sides are constructed with our highly technical, yet luxuriously printed fabric that is 83% polyester 17% Lycra. Fit and function almost great! These are really nice pants. I have only one minor problem that's not really a bug deal or a problem: except for the length they're great. Snug and comfortable. They're just too long.......about 4 inches too long. But I can remedy that by turning up the bottoms. Kind of ruins the slick look though. Oh well. I wear these shorts on long rides 15-30 miles. Great padding, some chaffing at the end of a longer ride on a hot day. Enjoy the pockets when commuting and on my road bike for the little extras I never had room for before!